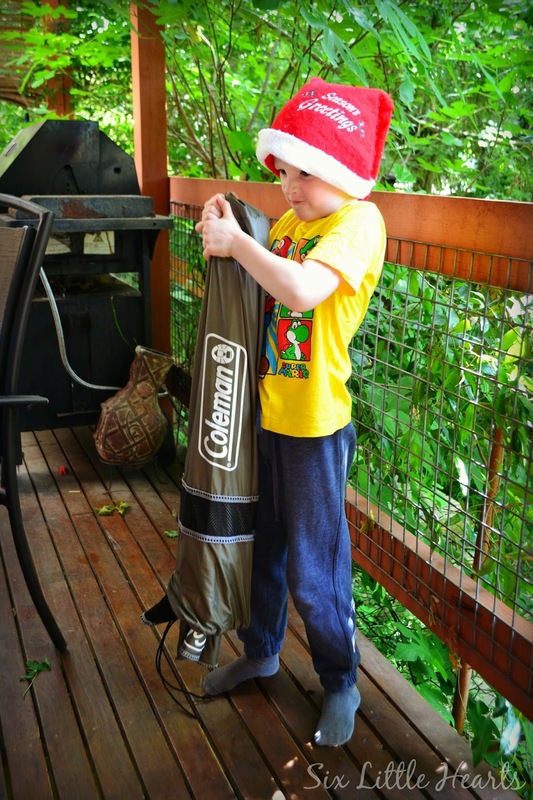 Today's Featured Thursdays is all about making camping more of a glamping experience thanks to Coleman. If you're unsure what glamping actually is, it's a term used to describe accommodation and facilities a little more on the luxurious side than those more rustic alternatives associated with traditional camping. I would have to say that sleeping and seating are the biggest hurdle for me when it comes to camping. I can handle slapped-up foods, (slightly burnt and gritty, undercooked or overcooked - just like you expect in the great outdoors). I can handle bad weather; the extreme heat or wet or cold. Seating though, that has to be just right for me. It's tough work being an adult, especially when you're an overworked parent. No matter where I travel or how I do it, I value rest, relaxation and comfort above everything and that equates to decent seating in my book. When Coleman sent me two fantastic chairs to review here, I was not prepared for the two fantastic chairs we received! These are true seating luxury and to be honest, I had no idea camp gear had come so far. It really has moved into the world of glamp gear for sure. I feel my interest in camping has been re-ignited! The adult's chair in particular is a glamp chair in every sense. It's fully padded and fits like a glove where the seat is concerned. 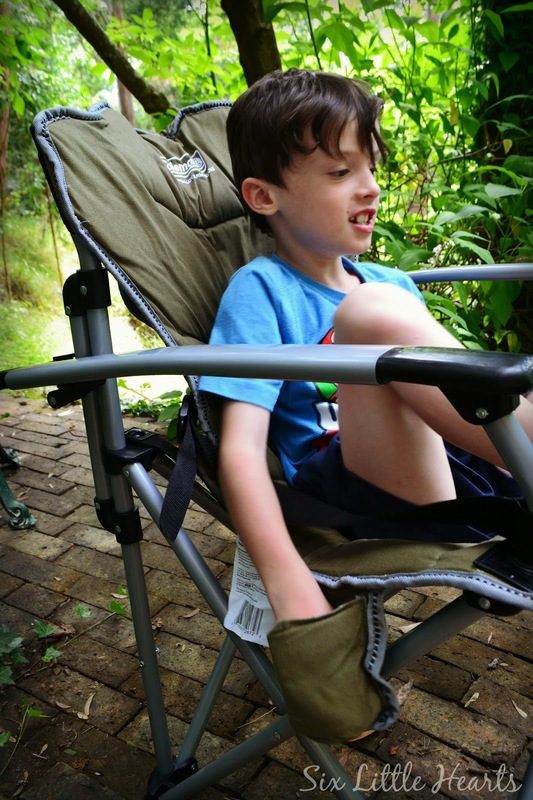 The Coleman Otway Alloy Arm Deluxe Chair is very much a deluxe experience. Despite its steel frame which holds a huge 150 kilograms, it remains lightweight and feels just like the comfiest armchair in your living room. I could seriously get used to this! 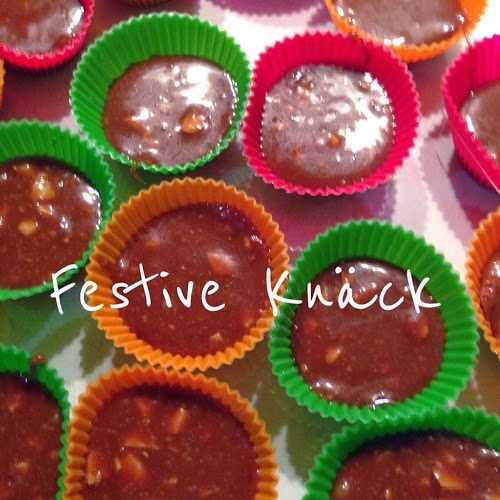 (If only I could get my kids off it for a few minutes to really enjoy it.) I can tell you now, this chair has actually made regular appearances in our lounge room as a chair in its own right and a popular one at that. Now if only I could get more of a turn on it! 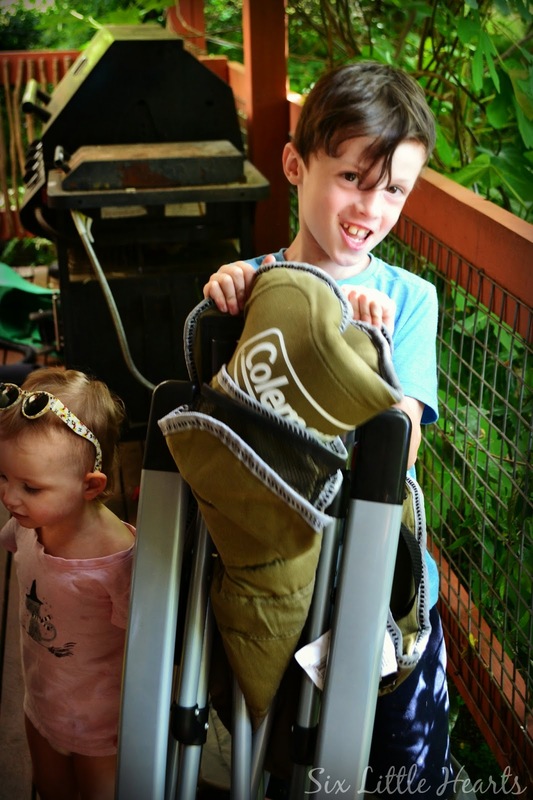 Coleman have got kids covered too with the great little Youth Sling Chair. 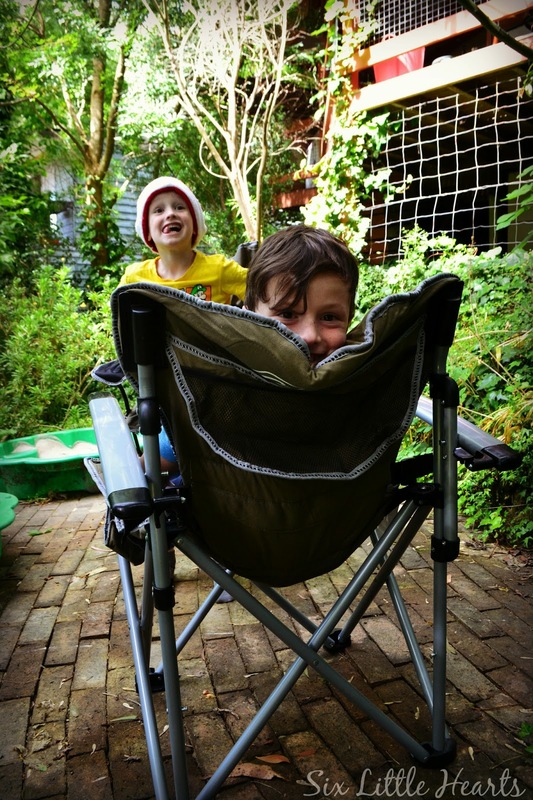 This cute seat holds up to 70 kgs and like its parent chair above, it is also styled in a strong steel frame to cope with the rough treatment kids can manage to pull. 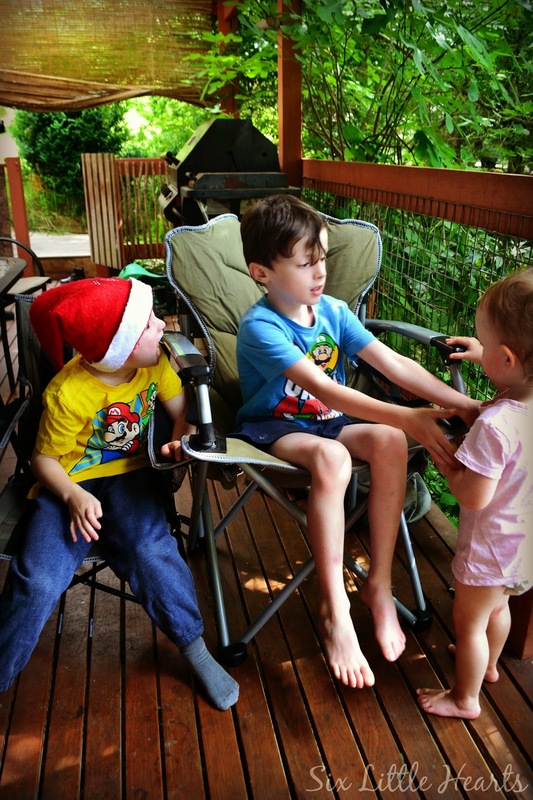 My boys adore this chair and fight over it whenever it appears so we may have to invest in extras! Not only does it look like our luxurious grown-up version but its locking frame ensures it is safe too. The dual cup holders keep your child content with refreshments and snacks while you enjoy your own chair...when you can get the kids out of it! Both of these chairs are covered by a limited one year warranty and together they are simply the best outdoor seating options we have ever tried. I am absolutely taking these chairs on our beach holiday this January. 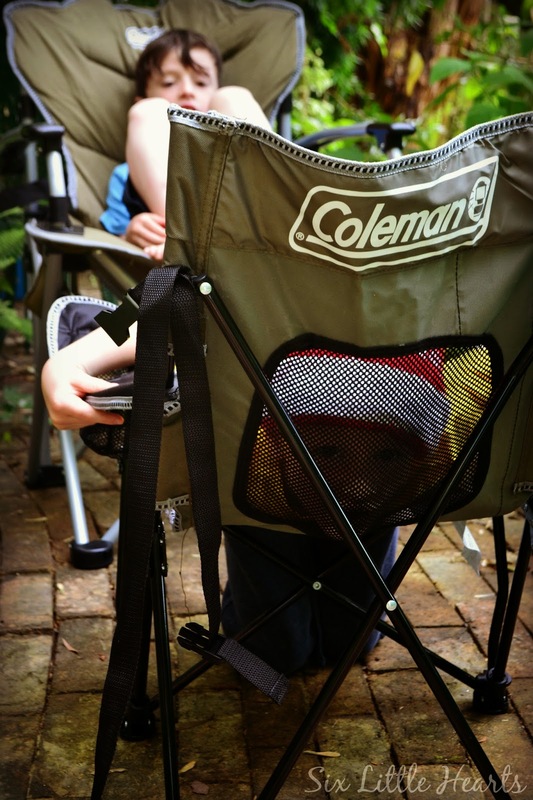 You can visit the Coleman website here to browse their exciting range of outdoor and camping gear and nab yourself a seat or two while you're there. The Youth Sling Chair retails for $39.99 and the glamorous Otway Deluxe retails for $119.99. Worth their weight these two. Celeste, (looking mighty cute), thinks her device is simply the best! Fitting this to your child is easy; just slide the one-piece aid over your child's arms and fasten it easily at the back with the secure plastic clip. We've had no trouble getting Celeste to wear this as the fun design makes her feel she's in high fashion. She loves it and we can't wait to try this one out at the shoreline on our beach vacation in a week's time. I don't think we'll lose her too easily wearing this one either! You can view the entire range and purchase Puddle Jumpers here. 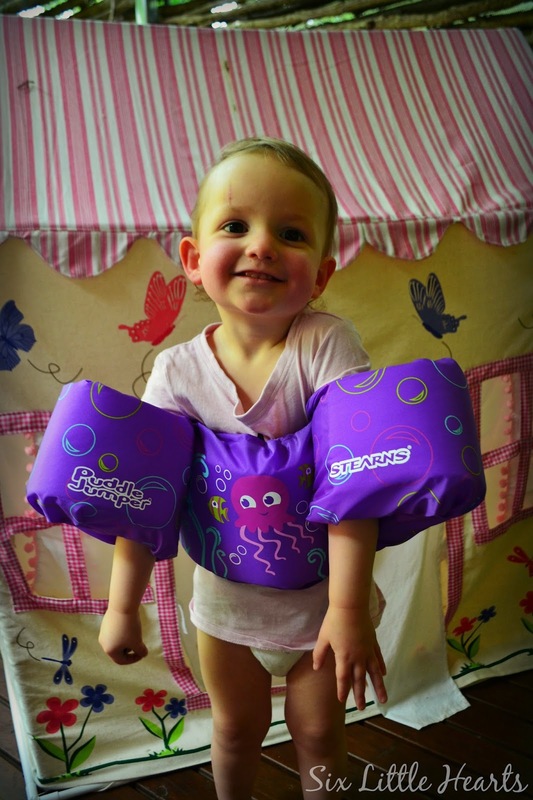 Puddle Jumpers are priced at $29.99 and there are some really cute designs to ensure your child is as impressed as they are safe in the water this Summer. Have you had any amazing camping experiences (or not so amazing experiences)? Should I brave camping again?